C. adamanteus is the largest rattlesnake species and is the heaviest known species of venomous snake, with one specimen shot in 1946 measuring 7.8 ft (2.4 m) in length and weighing 15.4 kg (34 lb). However, other venomous snakes may rival this species in weight. The much longer but more slender king cobra is probably greater in average body mass if not maximum weight, and the shorter but even bulkier Gaboon viper could (but is not verified to) exceed the eastern diamondback rattlesnake in both mean adult body mass and possibly even maximum body mass. Maximum reported lengths for the eastern diamondback rattlesnake are 8 ft (2.4 m)  and 8.25 ft (2.5 m). However, the stated maximum sizes have been called into question due to a lack of voucher specimens. Males are larger than females. Hawks, eagles, and other snakes have been known to prey upon young and adolescent specimens of C. adamanteus. Because of their large size, adults have no problem eating prey as large as fully grown cottontail rabbits. As the juveniles are capable of swallowing adult mice, they do not often resort to eating slimmer prey, such as lizards. In fact, eastern cottontails and marsh rabbits ( Sylvilagus) form the bulk of the diet in most parts of Florida. Squirrels, rats, and mice are also eaten, along with birds such as towhees and bobwhite quail. Other prey that have been reported include a king rail, a young wild turkey, and a mother woodpecker along with four of her eggs. It also eats large insects. 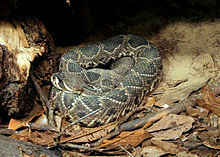 Rattlesnakes, including C. adamanteus, are ovoviviparous. Gestation lasts six or seven months and broods average about a dozen young. However, the young only stay with the mother for a few hours before they set off on their own to hunt and find cover, thus mortality rate is very high. The eastern diamondback can live beyond 20 years, but life expectancy in the wild is now typically shorter because of hunting and human expansion. ^ a b Hammerson GA (2007). "Crotalus adamanteus ". IUCN Red List of Threatened Species. IUCN. 2007: e.T64308A12762249. doi: 10.2305/IUCN.UK.2007.RLTS.T64308A12762249.en. ^ a b McDiarmid RW, Campbell JA, Touré T (1999). Snake Species of the World: A Taxonomic and Geographic Reference, Volume 1. Washington, District of Columbia. Herpetologists' League. 511 pp. ISBN 1-893777-00-6 (series). ISBN 1-893777-01-4 (volume). ^ a b c d e f g h i Klauber LM (1997) [First published 1956]. Rattlesnakes: Their Habitats, Life Histories, and Influence on Mankind (Second ed.). Berkeley, CA: University of California Press. ISBN 0-520-21056-5. ^ a b Fichter GS (1982). Poisonous Snakes: A First Book. Franklin Watts. ISBN 0-531-04349-5. ^ a b "Crotalus adamanteus ". Integrated Taxonomic Information System. Retrieved 28 November 2006. ^ Wood, Gerald (1983). The Guinness Book of Animal Facts and Feats. p. 256. ISBN 978-0-85112-235-9. ^ Mallow D, Ludwig D, Nilson G (2003). True Vipers: Natural History and Toxinology of Old World Vipers. Malabar, Florida: Krieger Publishing Company. 359 pp. ISBN 0-89464-877-2. ^ Klauber LM (1972). Rattlesnakes: Their Habits, Life Histories, and Influence on Mankind (2nd ed.). Berkeley, CA: University of California Press. ^ Ditmars RL (1936). The Reptiles of North America: A review of the crocodilians, lizards, snakes, turtles and tortoises inhabiting the United States and northern Mexico. Garden City, New York: Doubleday, Doran & Co.
^ Powell R, Conant R, Collins JT (2016). Peterson Field Guide to Reptiles and Amphibians of Eastern and Central North America, Fourth Edition. Boston and New York: Houghton Mifflin Harcourt. xiv + 494 pp., 47 plates, 207 figures. ISBN 978-0-544-12997-9. (Crotalus adamanteus, p. 439, Figure 199 + Plate 46). ^ Jones, A (1997). "Big reptiles, big lies". Reptile and Amphibian Magazine. 51: 22–27. ^ a b c d Campbell JA, Lamar WW (2004). The Venomous Reptiles of the Western Hemisphere. Comstock Publishing Associates, Ithaca and London. ISBN 0-8014-4141-2. ^ "Huge Rattlesnake Found in St. Augustine". WOFL Fox 35 News. 2 October 2009. Retrieved July 2, 2011. ^ United States Navy (1991). Poisonous Snakes of the World. New York: US Government / Dover Publications Inc. 204 pp. ISBN 0-486-26629-X. ^ a b Conant R (1975). A Field Guide to Reptiles and Amphibians of Eastern and Central North America, Second Edition. First published in 1958. Boston: Houghton Mifflin Company. xviii + 429 pp. + 48 plates. ISBN 0-395-19979-4 (hc), ISBN 0-395-19977-8 (pb). ^ a b c Wright AH, Wright AA (1957). Handbook of Snakes of the United States and Canada. Ithaca and London: Comstock Publishing Associates, a division of Cornell University Press. (7th printing, 1985). 1,105 pp. ISBN 0-8014-0463-0. ^ Dorcas ME, Hopkins WA, Roe JH (2004). "Effects of body mass and temperature on standard metabolic rate in the eastern diamondback rattlesnake (Crotalus adamanteus)". Copeia 2004 (1): 145-151. ^ Hubbs, Brian; O'Connor, Brendan (2012). A Guide to the Rattlesnakes and other Venomous Serpents of the United States. Tempe, Arizona: Tricolor Books. 129 pp. ISBN 978-0-9754641-3-7. (Crotalus adamanteus, pp. 66-67, 115-116). ^ Louisiana Department of Fisheries and Wildlife (2010). "Eastern Diamondback Rattlesnake". http://www.wlf.louisiana.gov/serpentes/eastern-diamondback-rattlesnake (last visited Mar. 9, 2011). ^ Means DB (2011). Diamonds in the Rough. (unpublished manuscript). ^ a b c d Mehrtens JM (1987). Living Snakes of the World in Color. New York: Sterling Publishers. 480 pp. ISBN 0-8069-6460-X. ^ a b c Ashton RE Jr, Sawyer-Ashton P (1981). Handbooks of Reptiles and Amphibians of Florida, Part 1, The Snakes. Miami, Florida: Windward Publishing Inc. 176 pp. LCCCN 81-51066. ISBN 0-89317-033-X. ^ Eastern Diamondback Rattlesnake at Florida Museum of Natural History. Accessed 2 July 2008. ^ a b Behler JL, King FW (1979). The Audubon Society Field Guide to North American Reptiles and Amphibians. New York: Alfred A. Knopf. 743 pp. LCCCN 79-2217. ISBN 0-394-50824-6. ^ a b c d Norris R (2004). "Venom Poisoning in North American Reptiles". In: Campbell JA, Lamar WW (2004). The Venomous Reptiles of the Western Hemisphere. Ithaca and London: Comstock Publishing Associates. 870 pp. 1,500 plates. ISBN 0-8014-4141-2. ^ Brown JH (1973). Toxicology and Pharmacology of Venoms from Poisonous Snakes. Springfield, Illinois: Charles C. Thomas. 184 pp. LCCCN 73-229. ISBN 0-398-02808-7. ^ Hasiba et al., 1975. Brattstrom BH (1954). "The fossil pit-vipers (Reptilia: Crotalidae) of North America". Transactions of the San Diego Society of Natural History 12: 31-46 . Brickell J (1805). "Miscellaneous chemical and medical facts, observations and conjectures". Philadelphia Med. and Phys. Jour. 2: 164 . Conant R, Bridges W (1939). What Snake Is That? : A Field Guide to the Snakes of the United States East of the Rocky Mountains. ( With 108 drawings by Edmond Malnate). New York and London: D. Appleton-Century Company. Frontispiece map + viii + 163 pp. + Plates A-C, 1-32. (Crotalus adamanteus, pp. 145-147 + Plate 30, Figure 86). Cope ED (1867). "On the Reptilia and Batrachia of the Sonoran province of the Nearctic region". Proceedings of the Academy of Natural Science of Philadelphia 18: 300-314 . Cope ED (1875). 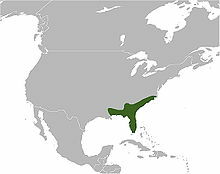 Check-list of North American Batrachia and Reptiles with a systematic list of higher groups, and an essay on geographical distribution based on specimens contained in the United States National Museum. Washington, District of Columbia: Government Printing Office. 104 pp. Ditmars RL (1936). The Reptiles of North America: A review of the crocodilians, lizards, snakes, turtles and tortoises inhabiting the United States and northern Mexico. Garden City, New York: Doubleday, Doran & Co. i-xvi + 476 pp. Goin CJ, Goin OB, Zug GR (1978). Introduction to Herpetology, Third Edition. San Francisco: W.H. Freeman and Company. xi + 378 pp. ISBN 0-7167-0020-4. (Crotalus adamanteus, pp. 155, 333, Figure16-23). Jan G (1858). "Plan d'une iconographie descriptive des ophidiens et description sommaire de nouvelles espèces des serpents ". Rev. Mag. Zool. Paris. 10: 148–157 . (in French). Jones A (1997). "Big reptiles, big lies". Reptile and Amphibian Magazine. 51: 22–27. Klauber LM (1956). Rattlesnakes: Their Habits, Life Histories and Influence on Mankind. 1st edition. Berkeley and Los Angeles, California: University of California Press. 1,708 pp. [29, fig. 2.11]. Klauber LM (1972). Rattlesnakes: Their Habits, Life Histories, and Influence on Mankind. 2nd edition. 2 Volumes. Berkeley, California: University of California Press. Lee CY (1972). "Chemistry and pharmacology of polypeptide toxins in Snake venoms". Annual Review of Pharmacology. 12: 265–286. doi: 10.1146/annurev.pa.12.040172.001405. Minton SA (1974). Venom diseases. Springfield, Illinois: Charles C. Thomas. 235 pp. Palisot de Beauvois AMFJ (1799). "Memoir on Amphibia. Serpents". Transactions of the American Philosophical Society 4: 362-381 . (Crotalus adamanteus, new species). Schmidt KP (1953). A Check List of North American Amphibians and Reptiles, Sixth Edition. Chicago: American Society of Ichthyologists and Herpetologists. 280 pp. Schmidt KP, Davis DD (1941). Field Book of Snakes of the United States and Canada. New York: G.P. Putnam's Sons. 365 pp., 34 plates, 103 figures. (Crotalus adamanteus, pp. 297-298). Smith HM, Brodie ED Jr (1982). Reptiles of North America: A Guide to Field Identification. New York: Golden Press. 240 pp. ISBN 0-307-47009-1 (hardcover), ISBN 0-307-13666-3 (paperback}}. (Crotalus adamanteus, pp. 202-203). Sonnini CS, Latreille PA (1801). Histoire naturelle des reptiles, avec figures dissinées d'après nature. 4 Vols. Paris: Deterville. (in French). [for a discussion of the publication date see Harper F (1940). American Midland Naturalist 23: 692-723.]. Zim HS, Smith HM (1956). Reptiles and Amphibians: A Guide to Familiar American Species: A Golden Nature Guide. New York: Simon and Schuster. 160 pp. (Crotalus adamanteus, pp. 11-112, 156). 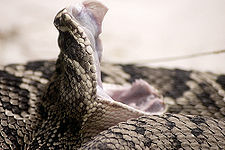 Wikimedia Commons has media related to Crotalus adamanteus. Crotalus adamanteus at the Reptarium.cz Reptile Database. Accessed 12 December 2007. Eastern Diamondback Rattlesnake at Yale Herpetology Page. Accessed 2 March 2007. Eastern Diamondback Rattlesnake at Biology Dept., Davidson College. Accessed 2 March 2007. Images of Crotalus adamanteus at SREL Herpetology. Accessed 2 March 2007. Crotalus adamanteus at Munich AntiVenom INdex. Accessed 2 March 2007.